Robbie Elliott made just eight Leeds United appearances in a brief spell during a time when the club was at its lowest ebb. Having started his career with Newcastle United he became Bolton Wanderers record signing in July 1997 but his progress with the newly promoted club was halted when he suffered a broken leg on his home debut against Everton. “To be honest, due to the circumstances, my preparation for the game wasn't ideal. I knew some of the lads from when I had spent time there the previous summer but there was some new faces at the club and the first time I met them was when we sat down for a pre-match meal. The three points were pocketed that day courtesy of a 2-1 win thanks to goals from David Healy, who would finish as leading goalscorer, and Jonathan Douglas. 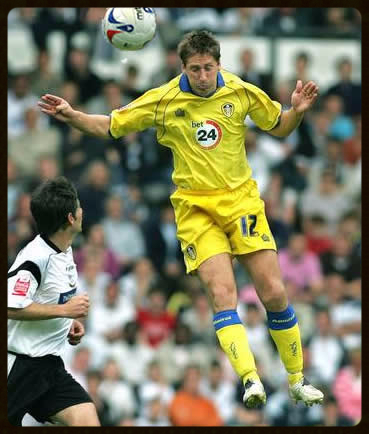 “I remember games as a junior against Leeds when they played on Fullerton Park but Elland Road was always one of my favourite grounds to play at and the supporters created some of the most intense atmospheres that I had experienced. After making his debut, Elliott’s next two appearances came against West Bromwich Albion. First in the FA Cup, then in League and unfortunately the Baggies ran out winners in both fixtures. It was during the league encounter that Robbie Elliott suffered a torn hamstring and had to be replaced by Tresor Kandol just before the hour mark. “It was an extremely frustrating time but I worked hard, got fit and made my comeback at Southend United in the middle of March. The lads had picked up four points from the previous two games with a win at home to Luton Town and a draw at Leicester City. The fixtures were passing us by and due to the fact that Southend were down there with us, we knew that three it was a huge game in the battle to avoid the drop. “It still amazes me to this day that the club was relegated. We had a dressing room full of characters, Gary Kelly, Robbie Blake, Shaun Derry, David Healy and Alan Thompson and on their day they were very good players but collectively, for whatever reason, too many things had gone wrong over the 46 games. “I was out of contract at the end of the season and I was hoping to sign a new deal but with the club in administration and all sorts of nonsense going on behind the scenes, timing was an issue and with other offers on the table I couldn’t wait forever. It was a real shame that I didn’t return. Thank you to Robbie Elliott for giving me his time and the opportunity to write this article.